Right now it is the height of our avocado season. We supply local grocery stores and a Mexican restaurant, so we try to stagger our crop so something is coming ripe almost all year ’round. But at this very moment, they are coming off by the dozen. 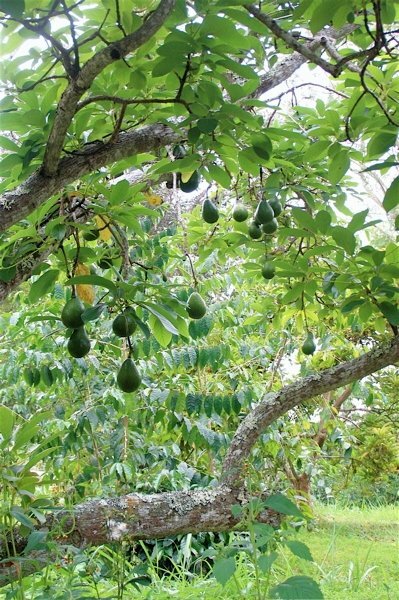 Sometimes when I look at an avocado tree, it is as if there are green ornaments hanging from the branches. There are tiny new avocados the size of grapes. Then there are the ripe ones. They vary from a few ounces with no pit (!) to one whopper we harvested at 4 pounds – six ounces. We looked up the world record –4 pounds – 12 ounces by a grower in Florida. At the rate we are going we may surpass even that. My daughter says ever since she tasted the avocados on our farm, Mainland avocados have never been the same. No matter how good one might be, it cannot compare to ours. And ours are only available here in our state. That is because to send them to the Mainland we would have to use poisons that have been outlawed in the United States. Only avocados from other countries where the poisons are still legal, are allowed in, after they have been sprayed. California avocados, because they are grown there, are are allowed. But they are runty, stunted little things when compared with our beauties. Recently some changes were made so that one certain small avocado grown here, known as the Sharwil may be shipped. If they are shipped only during winter months. After an elaborate cleansing process to protect crops on the Mainland from insects here, like the notorious fruit fly. Needless to say with the high cost and shortage of laborers and the complicated steps required, not many are being sent. I cannot image what they would cost, if they are available. Meanwhile, we have so many avocados falling daily on the ground that we have taken to forcing farm visitors, members of our Quaker Meeting, and friends to take them. Three times in the past week I have brought a big boxful to the thrift shop to put out with the free clothing. They are gone in minutes, either to astonished tourists or locals including one other farmer who likes to feed them to his pigs. Which doesn’t even count for all the fallen ones with minor flaws that I toss away from the trees. Or the ones we keep and eat every single day at lunch and dinner. Or the ones that rot and are given to compost, our worm farm, and the chickens. The good news: I know where to pick everyday from the ripest, readiest trees because of how many I collect from the ground, and, the Mexican place we supply is opening another restaurant. Already we are stockpiling for the new place. Amazing. And now the research is saying that they help with lowering bad cholesterol. We look forward to discovery and experimentation. Lol. Love to all. I love avocados and your stories/updates. Love to all.